Our meal last night was accompanied by some very good champagne, and this coupled with a very late arrival back at the hostel made getting out of bed a challenge. However, we still managed to leave at 8:30am to take the RER out to the Disneyland Paris Resort. I had arranged to meet up with my friend Jacques for the day, and with some quick mobile phone use we located each other. It only took a few moments to acquire park hopper tickets, a snip at €49 apiece. Both George and I had visited Disneyland Paris earlier in the year; me with St Bartholomew's Choir and George on his own as a birthday present to himself. 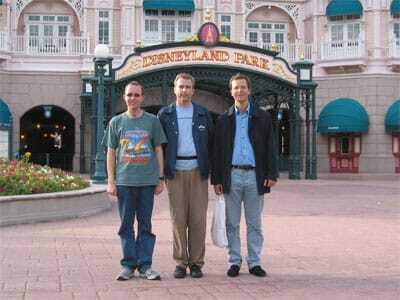 Jacques, though living in Paris, had never been to the parks. My first impression on walking into Studios was that the imagineers had run money half way through construction; the park felt incomplete. There were only ten attractions listed on the map, nothing like enough to justify the gate price. The park is no more than a half day affair even for the most hardy enthusiast, and it should really be given a ticket price to match. The single largest attraction is the Rock'n'Roller Coaster (#355), a launched indoor coaster from Vekoma. The ride was being run at the absolute maximum throughput and consequentially had barely any wait to speak of. On board, the ride proved great fun, tracking smoothly with no jarring whatsoever. The experience was greatly boosted by the lighting and soundtrack, even if I'm not a particular fan of Aerosmith. Vekoma have really learnt how to build good coasters in the last few years. Why can't they fix the SLC? George suggested doing the Studio Tram Tour - Behind the Magic before the queue built up. This is, as the name implies, a trip around some film sets, with action scenes that are really rather good. I won't spoil the details of the show for potential park visitors, but I will say that it is well worth doing if only for the scene with the Oil Tanker. We also did the Armageddon special effects show. Loosely based around the movie, this involves re-enacting a scene in the Russian spacecraft. Once again, this was particularly good and well worth doing. George had missed out on Big Thunder Mountain on his previous visit, but since the wait was three quarters of an hour we picked up a fast pass for later and went over to the Phantom Manor. It is still the sort of ghost train every park should aspire to, though for me I felt it had lost something in comparison to the larger version in Disneyland California. We collected a fast pass for Space Mountain, but as the wait was only fifteen minutes we elected to ride anyway, before using our fast pass for a second circuit in quick succession. I have to admit that in defiance of popular opinion I'm really fond of this ride; it can certainly be jarring from time to time, but the orchestral soundtrack is a fantastic piece of music that gives the ride at least fifty bonus points in my book. George wanted to ride the Casey Jr powered coaster. The wait of three quarters of an hour turned out to be the longest wait of the day but was partially made up for by the fact that we got the only seats on the train facing backwards, making the ride a somewhat different experience to my previous visit. I could have done without the soundtrack though; as I type this the tune is still stuck in my head and will not go away! At this point it was time to use our fast passes for Big Thunder Mountain. This ride has what I think must be the noisiest chain lift of any coaster I have ever been on. It makes an incredible racket, so loud that you cannot hear the person right next to you talking. However, this is the only minor gripe I can make about what is actually a surprisingly good coaster. The ride of just under four minutes is punctuated by three lift hills which break things up quite nicely. During my California trip in June I remember thinking that the Paris version was the poor cousin of the American model, but now I'm not so sure at all; I had forgotten the entire second half. I'd like to ride them both again to compare, though who knows when I'll be out in Los Angeles again. After a quick spin on Pirates of the Caribbean we went to ride Indiana Jones. The ride is by far the most intense of any in the park, and is badly in need of some extra padding on the headrests; it is impossible to ride without ending up with sore ears. I hope the trains will get new padding in the off season. We finished up our time in the park with a slew of dark rides; Blanch-Neige et les Sept Nains, Pinnochio's Fantastic Journey, Peter Pan's Flight, and the obligatory It's a Small World. While Jacques made his way home, George and I decided to continue across Paris to look at the Fete a Neu-Neu, a fair that had opened on August 28th. Neither of us had heard about this in advance; I had spotted an advertisement for it on a billboard and noted the details. I had asked a few friends to look up information on it for me on the Internet, but nobody could find anything. I'd even looked myself and found nothing. Rather than wonder if we'd missed anything really cool (after all, the Foire du Trône, held in April, is well worth visiting) we decided to make the trip. During our train journey, a mentally disenfranchised individual boarded the train and started complaining loudly in French. I could pick up a few words here and there, but not enough to figure out what on earth he was talking about. I commented to George that it probably made better sense if you spoke French. At this, a local businessman sitting across from us burst into silent laughter and uttered one word of English: No. The nearest Metro station to the fair, located in Bois du Boulogne, was a full twenty minutes walk from the fairground and was not clearly marked. However, we did eventually find where we were going, and went for a look around. There were no roller coasters in attendance; just a small selection of flat rides and a number of arcade machines, gambling machines, and food stalls. Nothing looked particularly exciting, so we took a series of photos and headed back to the hostel. 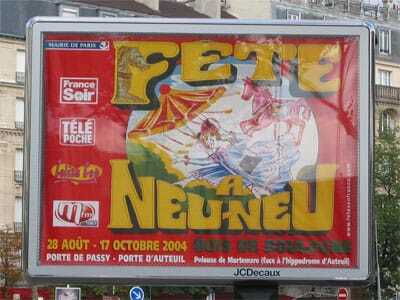 I have since posted the photographs so that anyone who may be researching the Fete a Neu-Neu in future will be able to find out something about it!